Oliver catches some zzz's (turn up sound). G'night from Late Bloomer Club member Oliver (turn up sound). Sweet, brave, little Oliver is back from surgery. He's groggy but felt well enough to sneak a little piece of banana treat. We do tell Oliver your good wishes and about the help that you send on his behalf . He he can feel it. You've made a big difference in his life. While we're still hand feeding and monitoring the newly arrived baby bunnies, SaveABunny continues to care for many other bunnies, including our very dear Oliver. One of the best vets in the world, Dr. Carolyn Harvey, rearranged her busy schedule in order to perform surgery on Oliver on Wednesday. As Marcy explains here we hope that this will help relieve Oliver's pain and give him a better quality of life. We will post another update after surgery. In the meantime, please consider sponsoring Oliver, whose surgery will be approximately $800. Oliver's infection has returned which is really sad given that he was making so much progress. He needs surgery again. As soon as we learn more we will let you know. Everyday we work with Oliver on healing the best he can. Per the veterinarian, twice a day we flush his wound with a curve tip syringe (no needle), apply a topical anti-inflammatory,give him pain medication and antibiotics. As a treat he gets some greens and a very small piece of apple. He's still kind of quiet, but as you can see from the photos there is a little more light and hope in his eyes. We really appreciate your caring and support for this bunny. Donation are urgently needed. Thank you from Oliver and all of us. Donations are tax-deductible. We realize that these pictures may be hard to look at and that Oliver's story is a sad one. However, it's very important for Oliver,and all "unwanted" rabbits that he represents, for his story to be told and heard. 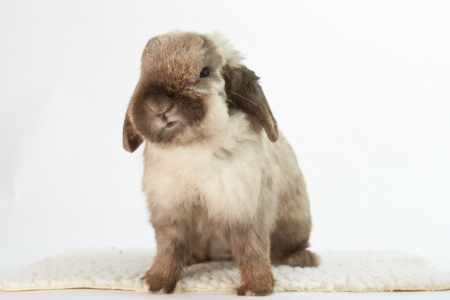 Oliver is a very cute, little Holland lop boy who was abandoned at the San Jose shelter in very bad condition. It is clear that he was very neglected and left to die alone. As you can see from the shelter photo (which is all we saw before taking him in)he clearly had some medical issues. Until he arrived at SaveABunny as an emergency rescue case in conjunction with The Rabbit Haven, we had no idea of the extent of his wounds. I cleaned him up, groomed him and suspected that he had a swollen testicle and an abscess on his cheek--both of which are significant health issues. As it turned out upon his initial veterinary examination he suffered from a massive herniated bladder--hanging OUTSIDE his body! (not a swollen testicle) and a very severe ear infection. The vet (a good rabbit vet) gave him a very grim prognosis requiring $3,000-$4,000 surgery without a guarantee of curing the problem. She recommended euthanization. We were heartbroken, but also don't believe in making a bunny suffer just because we don't want to lose them. To truly love a bunny it often means making tough choices. When this sort of life or death situation comes up we will try to get a second opinion as we did for Oliver. The rabbit specialist gave us a little less dire scenario, but still a very guarded one. She felt that Oliver was still interested in hanging around a bit longer and that he may be able to live pretty well with a herniated bladder, but we would need to monitor his ability to urinate properly, which so far seems ok.
Of much greater concern is the deep, invasive abscess in his ear and dental area. In order to have a shot at a "cure" he would need major surgery at UC Davis and she estimated the same cost range of $3,000-$4,000. We simply can't afford that much---at least not at this time and with all our other rabbits who need care. So, she suggested that we start with surgically opening the abscess and draining it. If he didn't wake from anesthesia we agreed not to resuscitate him. He made it through the surgery and is back at SaveABunny. The next step is that he now needs to have the opening flushed twice per day and swabbed with an anti-inflammatory. Additionally, he will continue with two pain medications and an antibiotic. We will be closely monitoring both his physical health, as well as his emotional health. We want and need him to enjoy his life and not be in pain and suffering. That would not be compassionate. We greatly appreciate everyone's loving words, kind healing thoughts and support. We URGENTLY need to raise funds for his ongoing care---regardless of if/when he might have surgery. We are also protectively seeking a VERY experienced and local medical foster home for him. We want him to receive truly focused one-on-one care. SaveABunny will cover all his expenses. It's a little embarrassing to admit, but sometimes I snore so loud I wake myself up (turn up sound).